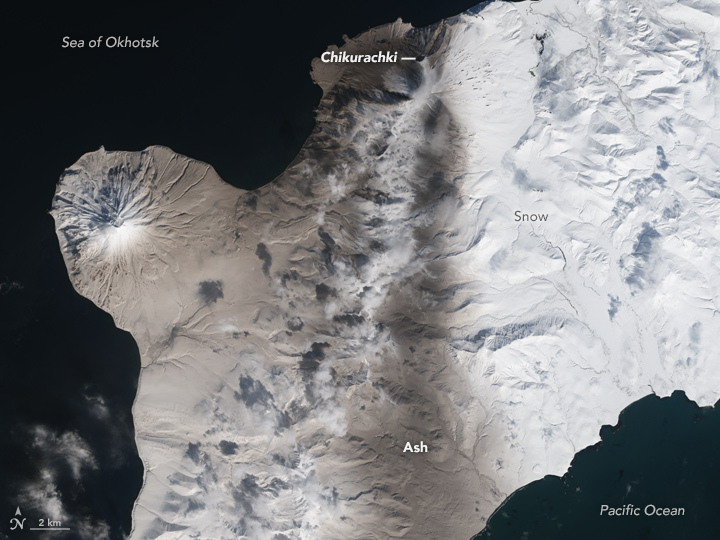 In March 2016, ash poured from a stratovolcano in the Kuril Islands. After a year of inactivity, Chikurachki erupted explosively on March 29, 2016, sending ash to heights of about 3 to 4 kilometers (2 miles). Noting that ash explosions up to 10 kilometers could occur at any time, volcano monitoring agencies posted a code orange aviation alert. Chikurachki rises 1,816 meters (5,956 feet) above the western Pacific Ocean on Paramushir Island, just south of the Kamchatka peninsula. It is made up of alternating layers of hardened lava, ash, and rock, and it is one of the more restless volcanoes in the tectonically active area. The Operational Land Imager (OLI) on Landsat 8 captured a natural-color image of the eruption on April 1, 2016. 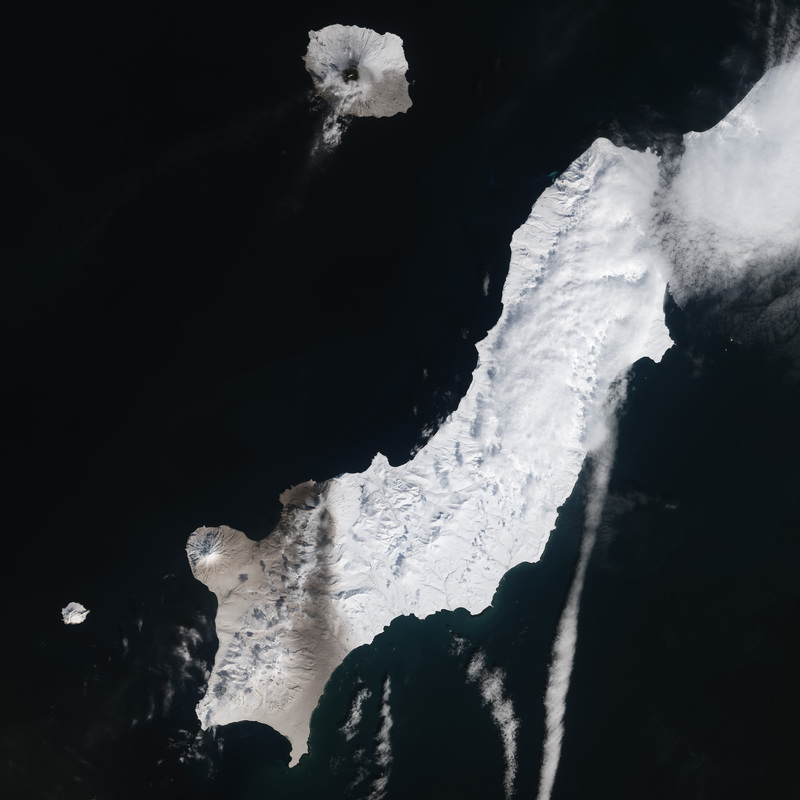 Ash has stained the white snow cover on the island brown. You can see the shifting ash plumes in images acquired by the Moderate Resolution Imaging Spectroradiometer (MODIS) on NASA’s Terra and Aqua satellites on March 30 and March 31. Global Volcanism Program, Smithsonian Institution (2016) Chikurachki. Accessed April 4, 2016. Kamchatka Volcanic Eruption Response Team (2016, April 4) Chikurachki Volcano. Accessed April 4, 2016. Volcano Discovery (2016) Chikurachki volcano. Accessed April 4, 2016. NASA Earth Observatory image by Jesse Allen, using Landsat data from the U.S. Geological Survey. Caption by Adam Voiland and Michael Carlowicz. 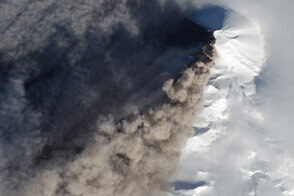 After a year of calm, the stratovolcano has erupted explosively. 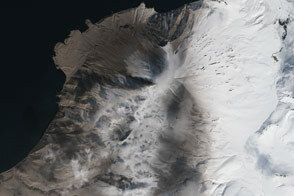 The stratovolcano is one of the most active volcanoes in the Kuril island arc.